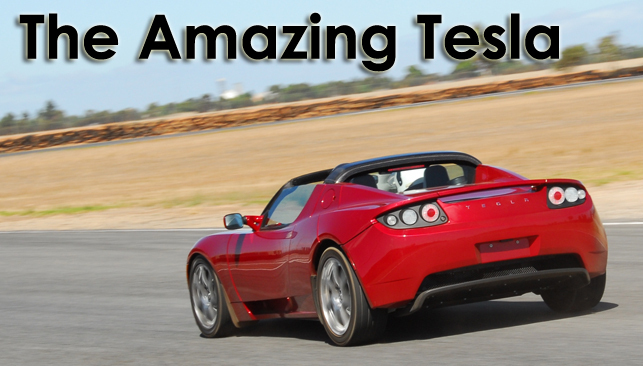 The car was the all-electric Tesla Roadster, and its performance – and the way it achieved that performance – was just so extraordinary that I am almost lost for words. That a start-up car company has created such a vehicle is simply unprecedented in the last century of automotive development. 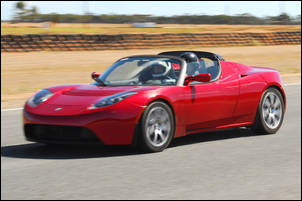 For the Tesla is not just a sports car with incredible performance but also a car that redefines driveability. Simply, it has the best throttle control of any car I have ever driven. It’s not just the acceleration that is revolutionary. The braking - achieved primarily through regen – has the same brilliant throttle mapping, an approach that immediately allows even a newcomer to progressively brake to a near-standstill at exactly the chosen point. 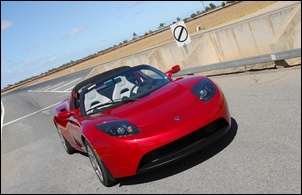 There’s only one Tesla in Australia, imported privately by Internode’s Simon Hackett. 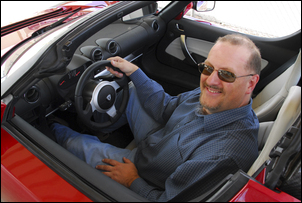 Simon is a car enthusiast – and more than that, an electric car nut. After driving a GM EV1 in the US – that’s before most were crushed – he became an instant convert to electric power. 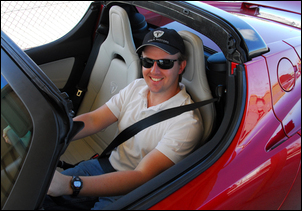 So he was happy to splash out a lot of cash to get a high position on the Tesla Roadster waiting list – and here, around AUD$200,000 later, is his car. So what’s the make-up of this awesome car? The electric motor is an AC induction design, controlled by a variable frequency drive. Maximum output is 185kW, achieved from 5500-6800 rpm, and max engine speed is 14,000 rpm. 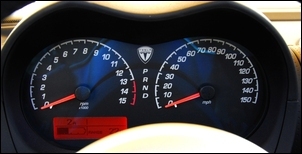 Peak torque of 376Nm is achieved from 0-4500 rpm. 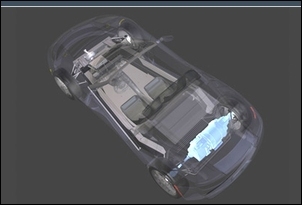 The electric motor drives through a single speed (8.27:1 overall final drive ratio) forced-lubricated gearbox. The motor runs on 375 volts and has an efficiency peak of 92 per cent (85 per cent at max power). The performance off the line from this driveline is extraordinarily strong, although it clearly tapers off a little above 100 km/h. 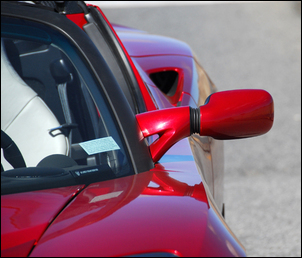 When getting on and off the throttle at low speeds, a very slight driveline clunk (backlash) can be felt. This isn’t noticeable except at carpark speeds. Reverse gear is achieved by electronically driving the motor backwards; max reverse speed is limited to 24 km/h. Traction control is standard and works very well. The maximum amount of regen braking that’s available has been carefully calibrated to avoid a ‘regen braking oversteer’ event – the regen works only on the rear wheels and the car does not have stability control. 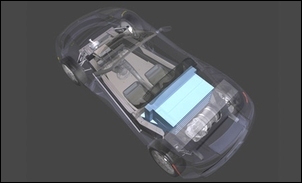 The battery pack, located in a mid-rear position within the car, comprises 6,831 lithium ion cells that total 450kg in mass. 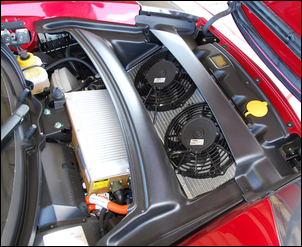 The pack has two voltage outputs – 13V for normal car accessories, and 366V for the motive power. 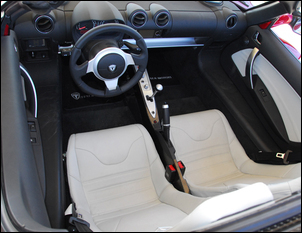 For driving, the battery will operate in the temperature range of minus 17 to 50 degrees C, while it can be charged in ambient temps of 0 to 45 degrees C.
The Tesla has a lot of Lotus Elise under the skin – and the windscreen is also Lotus. Suspension comprises unequal length wishbones front and rear, with coaxial spring/dampers and anti-roll bars used at both ends. 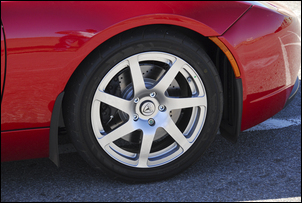 Brakes – especially developed for low rolling drag – use ventilated discs front and back. (In addition, regen braking is of course available.) An electric vacuum pump is used to power the brake booster. The steering is not power-assisted, the rack and pinion system having 2.8 turns lock to lock. The steering feel is not in keeping with the rest of the car – it loads-up in cornering and can kick-back a little. Front tyres are 175/55 16 while the rear tyres are much larger at 225/45 17. 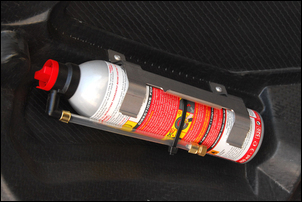 No spare wheel is provided – instead there’s a pressure can of tyre repair compound. Inside the snug cabin you’ll find clear instrumentation – including a tacho redlined at 13,000 rpm – and a speedo reading to 150 mph. 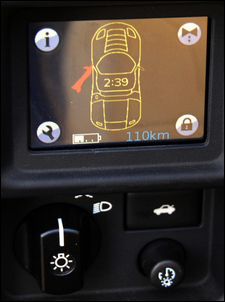 There’s also a small LCD within the main cluster and, down to the lower left, a colour LCD that can be toggled through a range of data screens. However, this display is rather hard to see. Arranged along the narrow centre console you’ll find the heater and air-conditioner controls. The styling of these can be viewed in two ways – either they look very ‘computer look’ and modern, or they're simply untidily non-integrated. The handbrake can also foul the gearlever if you manipulate the lever before releasing the brake. I thought it was the only area of the car that looked less than highly professional. The seats are thin but well-shaped, supportive and comfortable. Entry to the car requires stepping over the wide sill panel (part of the extruded aluminium chassis) and so easily getting in and out is an acquired skill. 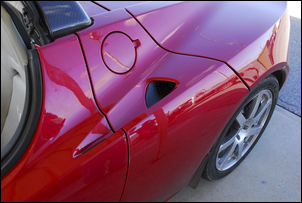 Rear three-quarter vision is poor but reversing is fine so long as you look centrally out of the rear window. The doors on this car drooped a little when fully open. All panels are of carbon fibre. Under the front lid you’ll find a controller for the air-conditioner electric compressor and a radiator for the liquid cooling of the battery. This liquid can also be refrigerated as required by the air-conditioning system. The coolant is circulated by an electric pump. 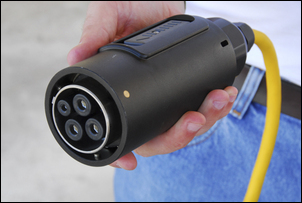 The battery can be recharged from any outlet; charging current can be specified by the owner and – via the GPS – the car then remembers the current capability of each charging station. At 70 amps charging current, the battery can be filled in 4 hours. At a more reasonable 12 amps current, the time is 20 hours. Note that these figures are for a fully depleted battery, something that would not normally be the situation. But for me the Tesla’s brilliance cannot be found in its spec sheet or design details. The car could have had all of these – and yet have been a pig on the road. It’s certainly not perfect, with better steering and some tidying-up of the interior on the wish-list, but its driveline is simply so incredibly competent that these criticisms become trivial in the context of the overall car. In my nineteen years of writing about automotive technology, I have never driven a car that so brilliantly extends the boundaries of what is possible, and that shows the way of the future in such an unambiguous way. With us for the day was Dr Andrew Simpson. Simpson, an Australian engineer, worked on the Tesla project in the US. He was heavily involved with simulation testing the Roadster - in particular, regen braking calibration and gaining the maximum possible range. He’s now back in Australia, working to put more electric vehicles on our roads. 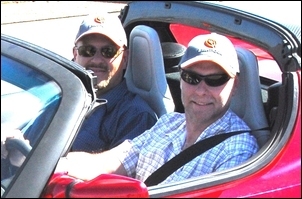 A huge thanks to Simon Hackett of Internode for making available his car for this story. If you’d like to learn more about the Tesla, go to www.teslamotors.com – the owner’s manual and spec sheets on the car are available for download.